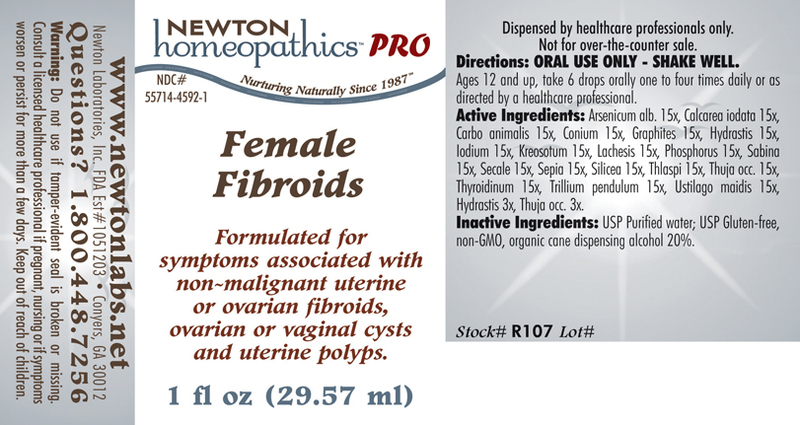 FEMALE FIBROIDS Formulated for symptoms associated with non-malignant uterine or ovarian fibroids, ovarian or vaginal cysts and uterine polyps. Directions: ORAL USE ONLY - SHAKE WELL. Ages 12 and up, take 6 drops orally one to four times daily or as directed by a healthcare professional. Arsenicum alb. 15x, Calcarea iodata 15x, Carbo animalis 15x, Conium 15x, Graphites 15x, Hydrastis 15x, Iodium 15x, Kreosotum 15x, Lachesis 15x, Phosphorus 15x, Sabina 15x, Secale 15x, Sepia 15x, Silicea 15x, Thlaspi 15x, Thuja occ. 15x, Thyroidinum 15x, Trillium pendulum 15x, Ustilago maidis 15x, Hydrastis 3x, Thuja occ. 3x. Formulated for symptoms associated with non-malignant uterine or ovarian fibroids, ovarian or vaginal cysts and uterine polyps.